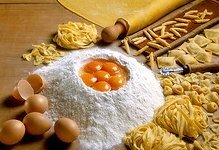 I have more than just homemade pasta recipes, check out more of my authentic Italian recipes at the end of the page. These recipes for pasta can be used in any Italian recipe, soups, pasta casseroles and much more. Fresh homemade noodles are worth the effort and make a good dish - outstanding. This homemade pasta recipe is perfect for all types of pasta creations. Easy to make too; especially if you have a pasta maker or mixer attachment. Put 1 cup of flour and 1/4 tsp salt in a large mixing bowl. Stir with a fork to combine. Form a well in the center of the flour. Add 1 egg and 1 tablespoon of oil to the well and whisk together to combine. Gradually begin to whisk in the flour with the fork from the side of the well. At the end, you will stir it in. The mixture will be crumbly. Add 1 tablespoon of water, sprinkling it over the dough. Mix well with the fork to incorporate all of the water. Add up to 2 tablespoons more water, but only enough to form the dough into a rough ball with your hand. It will not be perfect in shape. Work the dough on a lightly floured surface, pushing it with the heel of your hand. Work it for 10 minutes, or until the dough forms into an elastic, smooth ball. Cover and let the dough rest for 10 minutes. 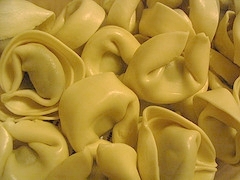 Roll out the dough from the center of the ball according to the type of pasta you are going to make. Rolling always from the center and away from yourself. Rotate the dough frequently to maintain it's shape. For rectangular and square sheets of dough; 1/4 turn. Circular ones; 1/4 turn at first, a little less with each roll. Keep unrolled portion the dough covered by the bowl. The cooking times for homemade pastas vary with the thickness of the dough, but all cook much faster than the commercial pastas. Use 1 cup flour and 2 cups whole wheat flour and follow the recipe. Add 6 tablespoons cooked, pureed and well drained spinach to the flour mixing along with eggs and oil in recipe above. This can also be done with whole wheat and semolina pasta dough. I've included this with my homemade pasta recipes. It's a must. This garlic butter sauce goes perfectly with freshly made pasta, including the stuffed variety. Makes the flavors "pop." Melt the butter over medium heat and add the ingredients. Cook, stirring, until the garlic is lightly browned. Toss with pasta and serve with grated cheese. Yum.